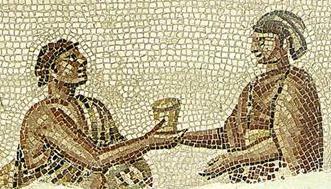 The Apostle Paul was constantly in need of the hospitality of others. A true itinerant pastor, Paul needed regular hospitality from the churches he visited. Often in his letters, Paul remarks on how grateful he is for the hospitality shown to him as he has traveled around. Such a remark comes at the close of the letter to the church in Rome, found in Romans 16:23. There, he thanks Gaius for his hospitality to him, as well as the church in Rome. He also notes the hospitality of a member of the civic government, Erastus, the city’s public works director. In these otherwise obscure individuals from 2000 years ago, we find the example of living out a hospitable life as a church. Such an example is exactly what my family and I have found in our reception here at Eastman First. We cannot say enough good things about this church and the hospitality we have been shown, for we have known our own Gaiuses and Erastuses here in Eastman! As an itinerant pastor (although thankfully not as itinerant as Paul! ), it does my soul, and the souls of Dana, Jackson, and Carter, much good to feel the warmth of your love and the welcome of your hospitality. Out of our gratitude, we are opening our home to you for three Gaius Sessions. Gaius, the Roman who had shown great hospitality to Paul, was known by the Apostle Luke and the Apostle John as well, both of whom refer to him in Acts and 3 John respectively. Gaius had interwoven himself into the fabric of the early church, and its that interweaving that we seek to do at our Gaius Sessions. On the dates and times listed below, Dana and I will be ready to welcome you into our home for a time of fellowship over some snacks as we get to know each other and share our lives with you. At these Gaius Sessions, we will also engage in some in depth conversation after our time of fellowship. We will gather in our living room after a while and begin to facilitate a conversation about the life of Eastman First Methodist. This will be an invaluable time to share your experiences, your thoughts and ideas, as we talk about what makes Eastman First your church of choice. Dana, Jackson, Carter, and I look forward to gathering with you at 1131 7th Ave. on Sunday, July 9 at 3pm, Tuesday, July 11 at 5pm, or Wednesday, July 12 at 7pm! Jackson and Carter would love to play with your children, so we hope you’ll bring them along. Should you have any questions, please feel free to call the church office, text my cell, or email me.